As I mentioned in my first post, this is a blog about wines I try and the story of their discovery - not a blog about tasting notes. As we're making our way through one of our wine racks at the home I'm finding that each bottle we open has great memories attached to it. Memories that are about more that the wine. Memories that involve people and experiences that I've enjoyed, and in some cases cherished. 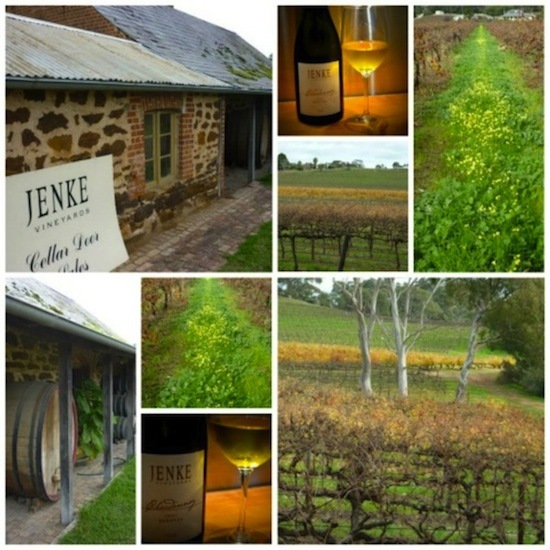 My discovery of this Jenke Chardonnay is one of those stories, and it wasn't really my discovery at all. On our way back to our accommodation we mentioned to our friends that we always try and find somewhere new to visit each trip. We quickly realised that we hadn't achieved that yet this trip and were rapidly running out of tasting hours to do so. It was right about that time that passenger #2 spied the sign for Jenke and yelled out 'quick turn here'. After following the long driveway we found ourselves outside a cute little stone cottage (see below). Realising that we probably only had about 20 minutes before they would close we quickly rushed in to see what they had to taste. I can't even remember everything we tasted, but I found 2 bottles of this chardonnay on my wine rack the other day - so I must have liked it. So how was it when I drank it at home? Pretty damn good. I'm fussy with Chardonnay's I don't like big buttery, oaky, overpowering ones. However I don't like them wimpy either. This went down great with our spicy dinner. In fact it went down so easily I think we drank the whole bottle that night - whoops!?! I've not had the chance of going back to Jenke since this vist. However I love the fact that finding a wine on my rack like this reminds me of the importance to try something different and embrace the opportunity before me. You never know what you'll find and what will end up on you wine rack.